Magnesium is a very important mineral, which you require in your diet. Deficiency is a serious condition, which leads to osteoporosis, muscle spasms, cardiovascular diseases, high blood pressure, diabetes, anxiety, migraine, and cerebral disorders. Read on to know about the foods that can help you combat the deficiency. Avocado contains 58 milligrams of magnesium, which is 15% DV of the mineral. It has a variety of health benefits along with being a tasty fruit. A number of minerals is contained in this nutrient rich base, which is used for soups. It is very nutritious and good for metabolism. Around 229 milligrams of magnesium is contained in a single serving of buckwheat. It is gluten free, and will not affect your sugar level. You can make soup, porridge, pancakes, or even cook it in butter. 91 milligrams of magnesium, which accounts to 23% of the DV, is present in a cup of black eyed peas/ moreover, it also contains fibers, iron, potassium, and proteins. You get 32 milligrams of magnesium from a medium sized banana. It also contains fibers, potassium, and Vitamin C. It is tasty and easily available. Your body gets 68 milligrams of magnesium from a cup of baked beans, which accounts to 17% DV. It is very good for reducing cramps, alleviating chronic pain, and makes your bones stronger. 13 milligrams of magnesium is contained in a 1.45 ounce bar of chocolate bar. This satisfies 3% DV of the mineral. It also contains minerals, vitamins, and antioxidants. Dark chocolate has got loads of benefits for your health. You get 12 milligrams of magnesium from a cup of cooked cabbage. It is tasty and healthy as well. 39 milligrams of magnesium is contained in a tablespoon of flaxseeds. This satisfies 10% of your DV of the mineral. Oatmeal contains 47 milligrams of magnesium in ¾ cup. It satisfies 12% DV of magnesium. It is really good to control blood pressure and cholesterol as well. 369 milligrams of magnesium is contained in a cup of pumpkin seeds. This amounts to 93% of your daily requirement of the mineral. Moreover, it is also rich in copper, magnesium, and Vitamin E.
You get 157 milligrams of magnesium from a cup of cooked spinach, which amounts to 39% of your DV. Raw spinach contains 24 milligrams or 6% DV. It is healthy and will not add to your weight. 83 milligrams of magnesium is contained in half a cup of sunflower seeds. This satisfies 12% DV of the mineral. Since they are high in calories, consume it only in moderation. 250 milligrams of magnesium is contained in half a cup of Brazil nuts. This comes to 63% DV of the mineral. 43 milligrams of magnesium is contained in a 100 gram serving of dates. This satisfies 11% of the DV. It contains lots of other vitamins and minerals, too. 170 milligrams of magnesium is contained in half a fillet of halibut. This satisfies 43% DV. It is a versatile and delicious fish, which is good for bones, skin, and heart. Molasses provides your body 48 milligrams, or 12% DV of magnesium, in a serving of 1 tablespoon. Replacing your sugar or artificial sweeteners with molasses is a good idea. It is a good source of nutrition. In 3.5 ounces of oysters, 76 milligrams of magnesium is present. It is a very tasty and healthy option to combat magnesium deficiency. 34 milligrams of magnesium is present in an ounce of pecans. This contributes to 8% DV of the mineral. Your body gets 196 milligrams of magnesium in half a cup of soybeans. This contributes to 49% DV of the mineral. This also makes your immune system stronger and makes your heart rhythm normal. Around 52 milligrams of magnesium is contained in a cup of wild rice. This equals to 13% of the DV of the mineral. Moreover, it also contains fibers, iron, folate, and zinc. Wild salmon contains 35 milligrams of magnesium in half a fillet, and satisfies 13% DV of the mineral. It is also rich in Vitamin B12, Vitamin D, and omega 3 fatty acids. You get 15 milligrams of magnesium from a cup of diced watermelon. It is very good to refresh you in the summer season. Whole milk contains 24 milligrams of magnesium in a cup, and this satisfies 6% DV of the mineral. Your bones get stronger and osteoporosis is prevented by the calcium contained in milk. Water is something which is highly nutritious. Water contains lots of magnesium, and the dosage depends from place to place. It is a vital part of your diet, and a very easy way to refill the magnesium content in your body. Wheat germ contains 440 milligrams of magnesium in each serving, which becomes 420 milligrams in the cereal form. This makes it one of the richest sources of the mineral. A serving is enough to fulfill your day’s requirement. Your body gets 211 milligrams of magnesium to satisfy 53% DV from a cup of yellow corn. It contains low calories, and is an apt choice for getting magnesium. 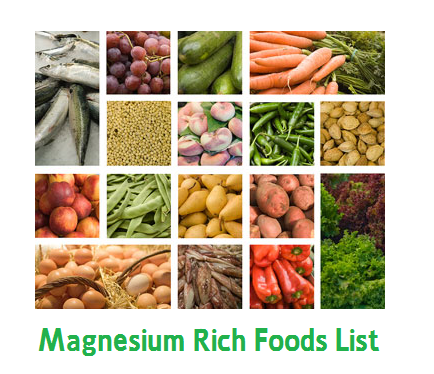 Now that you know the magnesium rich foods, use them to control magnesium deficiency. Deficiency is a serious condition, and should never be ignored. Fill your diet with magnesium rich foods, and stay healthy. Great list of food items. Banana is rich in magnesium and fibers. Thanks for the post.